In August, I visited my family in Pittsburgh, PA. I think Pittsburgh is one of the most photogenic cities I have seen. It has a wide variety of architectural styles, from gothic to modern, and the numerous and diverse neighborhoods offer many opportunities for unique photography. The photograph below represents one of the most famous views of the city. Let me take you on a brief tour of my hometown. This photograph was taken from one of the observation points on Mount Washington near the Duquesne Incline (the red car and inclined track). There are two inclines in Pittsburgh. The one visible here is the Duquesne Incline. A little under a mile to the east (to the right here) is the Monongahela Incline. The inclines connect Mount Washington with Carson Street below. One of the main attractions off of Carson Street is Station Square. You can’t see it in the photograph, but Station Square is now a retail center of stores and restaurants. In the past, the Pittsburgh and Lake Erie (P&LE) Railroad Station was located there. The historic and beautiful station is now the Grand Concourse restaurant, which is one of the best restaurants in the city. The Grand Concourse is on the National Register of Historic Places. Pittsburgh is situated at the confluence of three rivers, the Allegheny, Monongahela, and Ohio. The Allegheny River is flowing from the top center of this image. The Monongahela River flows from the right. The Allegheny and Monongahela merge together to form the Ohio River, which is flowing out to the left of the image. Eventually, the Ohio River joins the Mississippi River. You can see Point State Park Fountain in the middle of the photograph where the three rivers meet. On the North Side, which is toward the top left of the photograph, above the Allegheny and Ohio, you can see Heinz Field, the home of the Pittsburgh Steelers. Just to the right of Heinz Field is where Three Rivers Stadium used to stand. That land is now mostly a parking lot. To the left of Heinz Field part of the Carnegie Science Center is visible. One of the exhibits at the science center is the submarine USS Requin. A small part of the sub can be seen here in the Ohio River in front of the science center. Moving up the river on the North Side, you can see PNC Park with blue lights on its stadium lighting poles, home of the Pittsburgh Pirates. Very close to PNC Park but not visible here is the Andy Warhol Museum. The pop artist Andy Warhol was born in Pittsburgh, and the museum features some of his best works of art. Although he died in New York, Andy Warhol is buried in a cemetery in Pittsburgh. Pittsburgh is known as a city of bridges. With three rivers and numerous creeks of different sizes that feed into them, that was inevitable. Several of Pittsburgh’s bridges are seen here on the Allegheny River. That’s the Fort Pitt Bridge crossing the Monongahela River below the city on the righthand side of the photograph. This bridge leads directly from Pittsburgh into Mount Washington. I do mean “into”--the Fort Pitt Tunnel passes through Mount Washington to provide access to Green Tree, Carnegie, and other communities via the parkway, which ultimately takes you out to the airport. 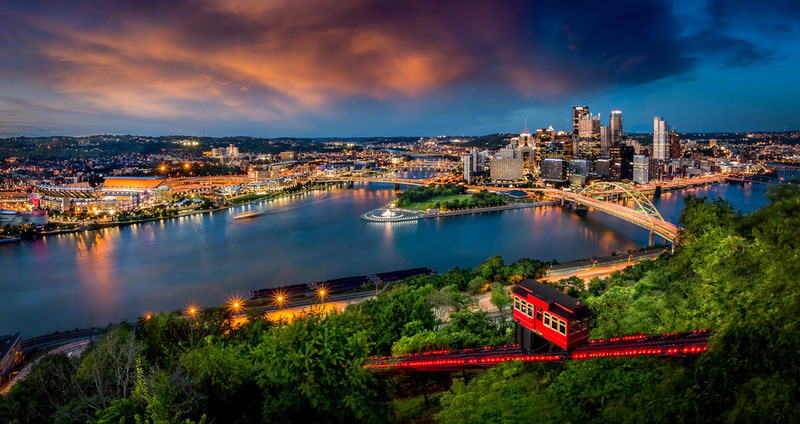 When you come into the city via the parkway and the Fort Pitt Tunnel, upon exiting the tunnel you are welcomed by an incredible sight as the city suddenly appears. It’s an impressive sight that many enjoy experiencing. The tallest building in Pittsburgh is the US Steel Tower. This building was originally called the US Steel Building. The name was later changed to USX Tower, and its official name is now US Steel Tower. It’s mostly obscured by PPG Place here, but you can see the top of it and part of the left side of it. It’s a three-sided building, and there used to be a restaurant on the top floor called The Top of the Triangle. I hope you enjoyed my little tour. Pittsburgh is a great city, and I love it. It was fun making this photograph and sharing a few of the city’s highlights with you.